Nashville, TN ... (Friday June 13, 2014) ... Black River Publishing’s GRAMMY-winning songwriter Josh Osborne was honored in his hometown this week in celebration of the joint resolution passed by the House of Representatives and the Senate adding the Kentucky native’s name to the US 23 Country Music Highway in Pike County. 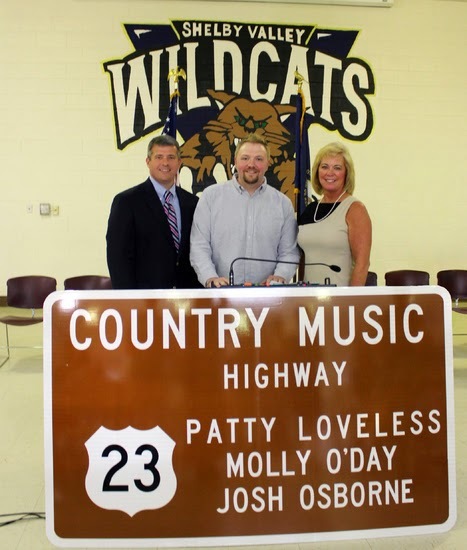 The home state honor was hosted on Wednesday by the Highway District 12 of the Kentucky Transportation Cabinet and occurred as Josh has four singles are almost entirely in the Top 20 on the country music chart. During the official ceremony at Shelby Valley High School, Pike County Judge/Executive Wayne T. Rutherford honored the alumnus with an additional presentation. Among the hometown crowd was Black River Entertainment’s CEO, Gordon S. Kerr; VP of Black River Publishing, Celia Froehlig; and other staff members. Also in attendance at the official ceremony was GRAMMY award winner and 2014 ACM Songwriter of the Year, Shane McAnally (Downtown, KissTomorrow Goodbye) and ACM, CMA and GRAMMY nominated songwriter Brandy Clark (Better Dig Two, Mama's Broken Heart). Both close friends and co-writers of Osborne, the two of them joined Josh at the Hilton Garden Inn that evening to perform a songwriter’s round sponsored by Johnson Industries, benefitting The Pike County Schools’ K.I.D.S. initiative. The home state honor comes on the heels of Josh’s astonishing eight weeks of having five singles in the top 30 on the country music chart. Currently, Josh’s singles include Blake Shelton’s "My Eyes," closely followed by "We Are Tonight," Billy Currington; "Chainsaw," The Band Perry; and Eli Young Band's, "Dust."